It turns out that in 2003 Rebekah Wade, then editor of the Sun, admitted to a parliamentary select committee that the Sun had paid police officers for information on people for newspaper stories (1). If that happens at the Sun, what are the chances of it not happening at the News of the World – another brand in the Murdoch cupboard of scratchy toilet paper? 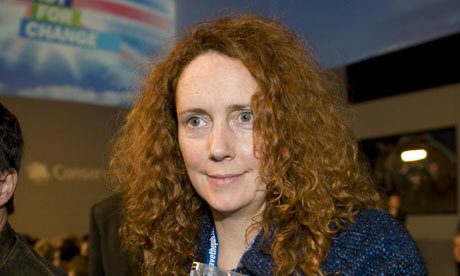 What are the chances that it didn’t continue until at least the current phone hacking scandal? This puts a new light on the police’s unwillingness to investigate phone hacking at the News of the World much; and their refusal to tell people they and their numbers were listed in the notebook of private investigator Glenn Mulcaire ( a convicted phone hacker, paid by the News of the World). If police officers have taken money for information from the Murdoch press, they won’t shop them for fear of losing their own jobs, possibly being convicted themselves – and at the least losing their additional income from feeding the tabloids in future (2). It also put’s a new light on their determination to convict Tommy Sheridan, one of the victims of News of the World phone hacking. Time magazine reports that in 2003 she (Rebekah) told the parliamentary media and culture committee that “We have paid the police for information in the past.” (3) Rebekah (now Brooks) is now Chief Executive of News International, a subsidiary of Murdoch’s News Corporation. News International owns both the Sun and the News of the World. MPs apparently backed off from demanding Wade (now Brooks after a divorce) be called before a parliamentary select committee again more recently, for fear the Murdoch press would target their own personal lives (4). Since Wade’s earlier admission shows the police are hiding corruption in their own ranks and collusion with illegal acts by tabloid newspapers, it’s time MPs got some balls and stopped caving in to Murdoch.